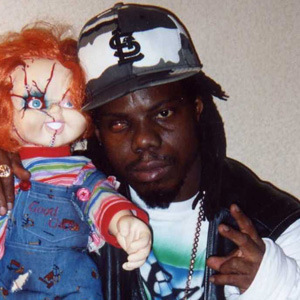 Bushwick Bill of the Geto Boys has been sitting in with various acts at the Continental Club Gallery the past two weeks and has been so inspired by the interplay with live musicians that the rapper has moved the jam to Arlyn Studios at 6 a.m. on a couple of occasions. With Gordy Johnson of Grady producing and playing slide guitar, the group has put down about four new tracks and and is considering putting them out, says studio co-owner Will Bridges. The impromptu sessions have happened Mondays after Bushwick rapped with Johnson’s spooky duo sit, down, servant !! at the Continental Club Gallery. Stefan of Big Sugar has been playing drums on the sessions. And now the Bushwick band is going to play its first scheduled concert Sunday at Hotel Vegas at 11 pm. Things are still rough and developing, so cover is only $5, for what will also be the unofficial Rakim after party. Chuck and Rak, playing that night at the Mohawk, go way back. This entry was posted on February 13, 2013 at 8:32 pm	and is filed under Uncategorized. You can follow any responses to this entry through the RSS 2.0 feed. You can leave a response, or trackback from your own site. any more shows coming up for bushwick?